So never in my life have I been a runner. But in the last year, I’ve started taking much better care of myself, and have lost some weight and have realized the physical and mental benefits of regular exercise. I can’t afford a shrink, but I can pop my iPod in and take off around the block. It’s free and it makes me feel good, as I’ve written before. The Wiz at MMW keeps saying I’ve joined the Crazies, but that’s because her sister is a devoted runner and she’s losing me too. It’s still a longshot to call me a runner- but as I mentioned in a post a few days ago, I’ve committed to my first race. Most people start with a 5K or even a 10K- but nope- along with my mom and two of my cousins, I’m going to run the Disneyland Half Marathon. 13.1 miles. It makes me want to puke even typing it. Also, This Mama Makes Stuff engenue Carrie is running it as well, and Carrie and I have been trying to get together for what seems like years. If you don’t know Carrie, you simply must- she’s one of the most talented people I’ve ever known– she makes me feel like a slacker– and she sparkles! So… here goes nothing. I’m probably going to write a lot about my misery as I move towards this seemingly unattainable goal. Wiz, just don’t read for a while. Apologies in advance. Anyone else? Join me! Susan, I would LOVE it if you came! I start to panic when I actually think about it- but I’m gonna do it! Cool! My wife and I have looked at the Disneyland Half, since my parents live in Fl. But I’ve been nursing a calf injury and still can’t do more than a mile without serious threatening twinges… Sure feels good to run though. When I am not up for the distance I always use the run/walk method. You can go a lot farther with less using that method. My last marathon I was returning after a recent injury and managed to finish in fine time without soreness. I personally run 5 and walk 1, give or take. In the end it is way better than running 80% of the race and then deathmarching to the end. I have done that too. Good luck and welcome to the world of running – be warned it can be addictive. I am training for a 100 mile trail race. I’m surrounded!!! You, sister, and my entire ward is basically filled with runners!! But doing it to get into Disneyland is not crazy at all, and I will love to read about it. I am exercising a lot more lately as well, I do see the physical and mental benefits, but I just don’t love running. It’s boring to me, (the same motion over and over again for hours? FUN!) and I see some injuries (did I mention my entire ward runs?) and the compulsion to run marathons is just bizarre to me, even though I can see how that would motivate you to run more. I think it’s the mild addiction thing. But if you like it – MORE POWER TO YOU. So have fun, and enjoy it! Setting and achieving goals is awesomeness. I have a friend that did the Disneyland Half last year, I do have to say that she did get an awesome looking medal! My husband want to do a full marathon, not start with a half, but the full…. When I ask him why he says to get it over with, so he can check it off his list of things to do and to say he’s done it. Me, I’m more of a baby steps kinda gal thinking that if 3.1 miles won’t kill me than maybe I can do twice that- or three times that etc… Good luck in training! I have almost sort-of started jogging recently. I thought I hated running, but the 3x I’ve gone in the last few weeks have been really pleasant. Good luck with your training! I think that half is called the “Princess Half’, isn’t it? All the better–you’ll feel like royalty when you’re done! Okay, actually, that’s totally bogus, you’ll feel like crap when you’re done, but the week AFTER you’re done, when the pain stops and you can walk normally again, THEN you’ll feel like royalty and you’ll look back on it and think, “Wow, did I really do that?” It’s a nice feeling to be in awe of yourself :). Just leave me in the dust. I have no plans to run the entire 13.1 miles. I figure if I can run the first 5 then walk a couple run one walk a couple I will be fine. I am not going to break any records, I don’t even care if I get picked up because I am going too slow. All I care is that I tried. Catching up on my blog reading tonight and I found this! And you wrote it on my birthday even. Can’t wait for you to come down for the race so we can meet and sparkle together. You are going to rock it and it will be an awesome accomplishment. 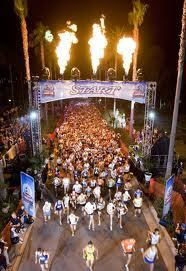 The Disneyland half is one of the coolest races EVER.